These Pork Chops with Cherry Sauce are so delicious! This amazing dinner will be on your table in just 30 minutes. Comfort food is back in full force in my kitchen. So are the big, bold red wines, like Merlot. 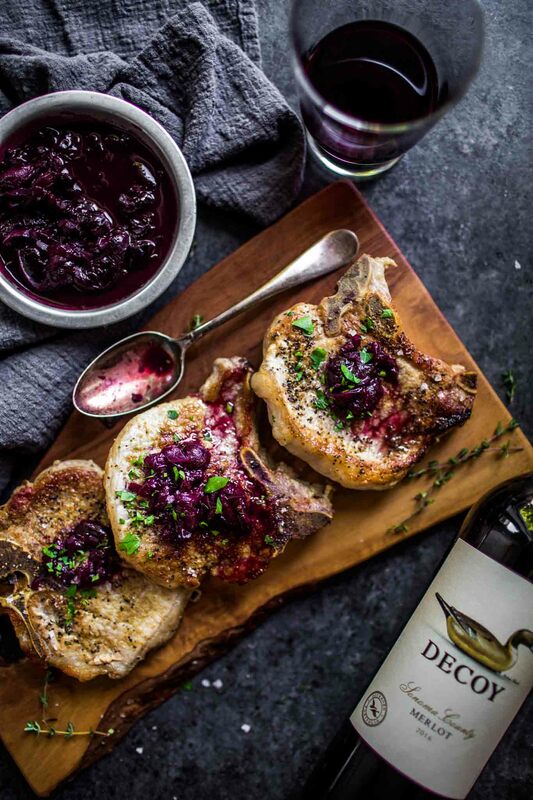 This recipe for Pork Chops with Cherry Sauce is my newest comfort food creation, and I’m pairing it with Marvelous Merlot. This dish just calls out the fact that Fall is upon us. Don’t you agree? Let’s bring on the rich meats, simmered sauces, and fleece socks! How Do You Make Pork Chops with Cherry Sauce? I started by giving my pork chops some love with a rubdown of smoky coriander, ground mustard and a pinch of salt and pepper. Don’t skip this step, because you really want to season those chops, to give them plenty of flavor. I prefer to use bone-in pork chops as they tend to cook more evenly and dry out less than the boneless variety. Then, I made a tart cherry sauce by simmering some frozen cherries with a bit of balsamic vinegar, shallots and red wine. It’s the the perfect combination of tangy, rich and sweet. What Do You Serve with Pork Chops with Cherry Sauce? There are lots of side dish options for this yummy dish. Try serving it alongside some mashed potatoes, roasted sweet potatoes, or buttered egg noodles. What Do You Drink with Pork Chops with Cherry Sauce? It’s time to Fall for Merlot. 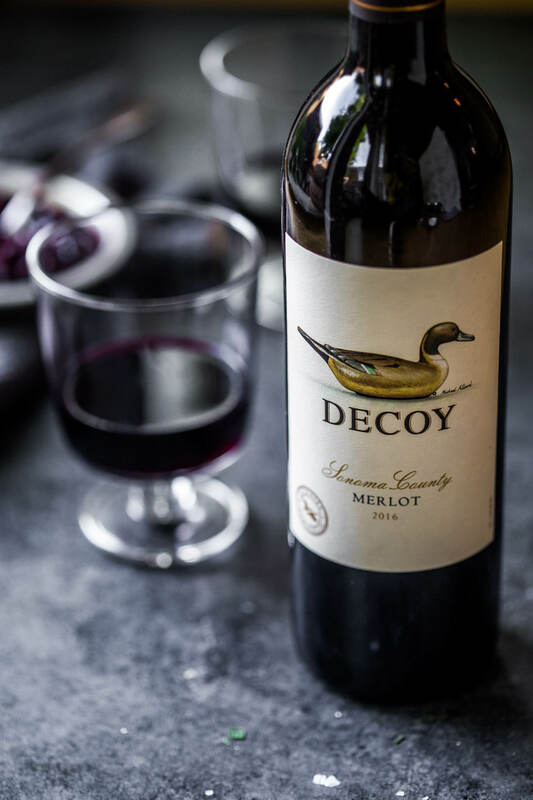 I paired a bottle of Merlot from Decoy Wines with these succulent pork chops and it was the perfect match. 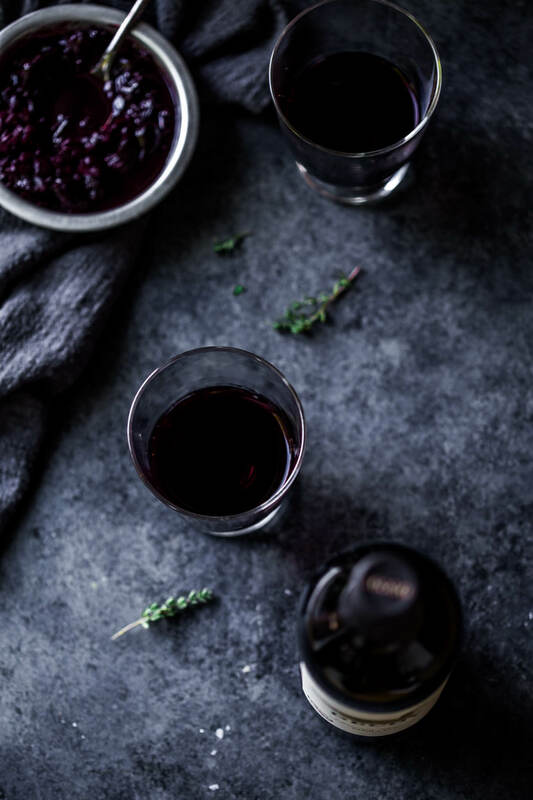 With notes of black cherry, a balanced acidity and a concentrated finish, it was the perfect wine to balance the richness of the pork chops and the tangy cherry sauce. Did you know that October is International Merlot Month? 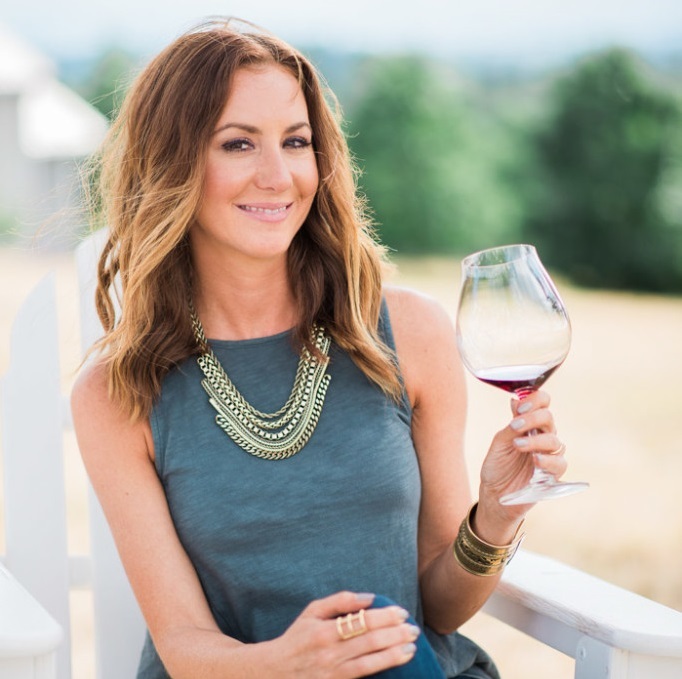 Be sure to follow along with me on social by using the hashtag #MerlotMe all this month! And, if you make this dish, be sure to tag it too! 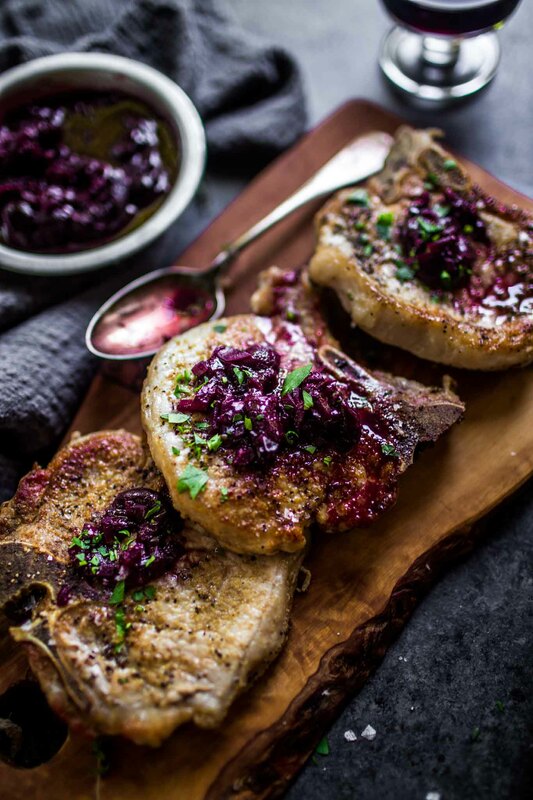 There’s really no excuse not to give these yummy Pork Chops with Cherry Sauce a try this fall. Would you guess that it only takes 30 minutes from start to finish? I love that!!! If you’re not a pork fan, this cherry sauce would also be amazing served over roasted chicken or duck. May your fall be filled with an endless supply of warm socks, red wine, and the Bravo network. Cheers friends. Pat the pork chops dry with paper towels. Place the salt, coriander, mustard, and pepper in a small bowl and mix until evenly combined. Rub all of the spice mixture all over the pork chops, set aside. Heat oil in a small saucepan over medium heat until shimmering. Add the shallot and cook, stirring occasionally, until softened, about 3 minutes. Season with salt. Stir in the cherries, red wine, and vinegar. Cook until the cherries soften and the wine has reduced by half, about 10 minutes. While the sauce reduces, begin cooking the pork chops. Heat oil in a large, cast-iron or oven-safe frying pan over medium-high heat until shimmering. Add the chops and cook, undisturbed, until the bottoms are golden brown, about 4 minutes. Flip over and place the frying pan in the oven. Bake until the chops are golden brown on the second side and the juices run clear, about 7 to 10 minutes. Spoon the cherry sauce over the chops and serve. If you loved these Pork Chops with Cherry Sauce I would appreciate it so much if you would give this recipe a star review! Also, be sure to snap a picture of your finished dish and share it with me on Instagram using the hashtag #platingsandpairings and tagging me @platingsandpairings. Ok this sounds amazing. Cherry sauce?! I’m excited to try it! you had me at Merlot and fleece socks! 😁 growing up in California and spending my early adulthood there, I tend to gravitate toward CA Merlots. I remember going to a cherity planning meeting in OR and someone asked, “What is a wine 🍷 that is university liked?”. I automatically said Merlot. They said Pinot but I begged to differ. 😉. And paired with cherries 🍒, talk about yumm! Can’t wait to try this! That cherry sauce is SO PRETTY! It looks like a lovely holiday dinner. Yes! Maybe it would work with some Jackfruit? I prefer bone-in pork chops too. This cherry sauce looks like the perfect sauce for pork chops with a big glass of that Merlot. I made this last week- so flavorful and the pork seasoning was perfect. I loved the sauce and the wine pairing too! I’m so happy you liked it Kelsey!